Math Worksheet Land provides a wide range of excellent math worksheets created by a dedicated team of sixteen math teachers. There are over 60.000 practice worksheets and lessons spanning nearly 50 different math topics from addition to vectors. 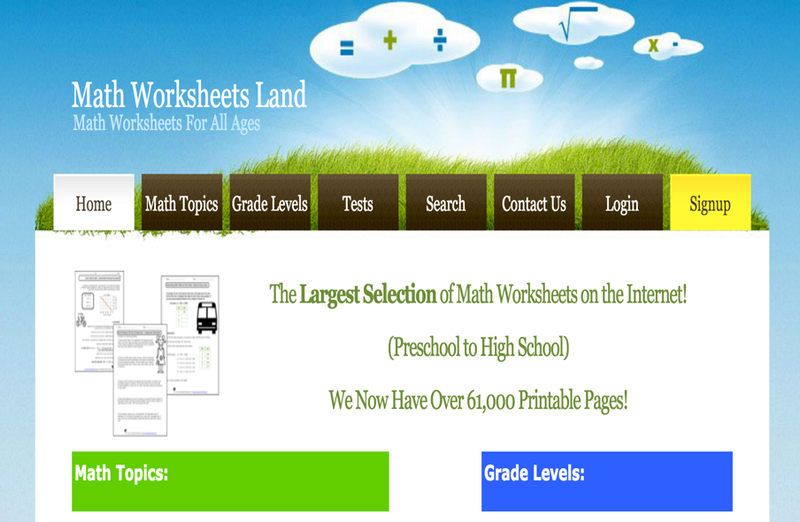 All of the materials provided by Math Worksheet Land are aligned to Common Core Math Curriculum. You can browse worksheets by grade level (preschool to high school) or by math topics. Math Worksheets Land’s materials are not free and only active members are granted copyright access for unlimited printing. ‘Printing is fully granted to Math Worksheets Land members for use with the students that they are directly responsible for. Our materials cannot be used for commercial purposes. Materials cannot be shared with nonmembers or students of nonmembers. When a membership expires, is canceled, or is not active; print rights are not granted’. As of this week, membership is only $29 per year (40% discount). As a member you get access to answer keys to everything, unlimited access to all grade levels and many more. There is also a section in the site for math tests and topi/skill based quizzes for members to download and use with their students.